You are here: Home / Personal Finance / I’m the Victim of a Truck Jackknife Accident – What Should I Do Next? I’m the Victim of a Truck Jackknife Accident – What Should I Do Next? Getting in any car accident is a scary experience. But, a truck jackknife collision could be one of the possible worst driver experiences you could ever go through. Imagine being on the highway and seeing a huge 18-wheeler losing control in front of you. Before you get to stop your car as the truck skids and the trailer swings from one side to another, it might be too late, and you might become a victim of a jackknife accident. 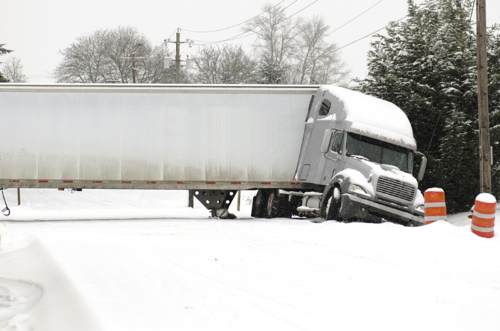 Jackknife accidents can occur from a variety of reasons: improper brakes and adjustments, sharp curves, improper driving, high speeds, weather conditions or even driver fatigue. Although any car can experience these problems, the sight of a truck losing control is truly terrifying. You probably know that already if you’ve been in a jackknife accident. The question you may be asking yourself now is: now what? I am alive and unharmed, so what are the legal steps that I should follow to get proper compensation? After the initial shock of the accident is over, try to look at the event objectively and identify the puzzle pieces that led to it. Make a mental note of all the details you can think of and share them with the police. Was the truck speeding? What were the weather conditions? Did anything, in particular, catch your attention during those moments? Try to find some eye witnesses as well and get them to offer a statement. The more information you can offer to both the authorities and your semi truck accident lawyer, the better the chances of obtaining compensation for your pain and suffering. While you can go about this process on your own, a lawyer would definitely make things easier for you. Prepare all the necessary files and legal reports before meeting one. That way, you can speed things up and enable them to build a strong case. With the right information at hand, a lawyer can ensure that the liable party will offer compensation for the damages, whether physical or emotional. A truck accident may impact more than just your health. It is also a highly traumatic experience, and you could seek compensation for the emotional turmoil you’ve been through during those moments and after. Another strong argument for getting compensated is a lost wage. If you can’t work because of the injuries you’ve sustained during the accident and you are missing work days, then the liable party should cover for your loss. Although this is a scenario we don’t like to think about, you could also get compensation for wrongful death, in case you’ve lost a loved one in such an accident. If that’s the case, then the legal steps that you need to follow are a bit more complex than with a regular report case. It will require special attention from your lawyer since it might include homicide and other accusations if the circumstances of the accident make it plausible. If you’ve been in an accident before, then you know that it is easier to settle and mediate the conflict than going to court. A good lawyer that can negotiate on your behalf and get you the compensation you deserve is paramount at this stage of the process. However, sometimes even the best of lawyers can’t reach an agreement, and you have to go to court to settle the case. If that happens, make sure to make trial expenses part of the compensation you require too. That way, if you win – and you most probably will with a good lawyer who builds a solid case, you would have ensured your justice without spending a cent from your money. A truck jackknife accident can impact you on all levels. Don’t rush into the process of making the person responsible pay for your suffering. Take the time to heal yourself first, both physically and emotionally. And, look for a competent lawyer who can help you get the justice you deserve. People cope with trauma in different ways, but what matters most is for you to be alright.